EV Premium Drive is a passenger transport company with top-of-the-range driver and ecological vehicle. The company is located in the Enghien-Les-Bains area (Val d’ Oise), near Paris. EV Premium Drive, your Private Driver in Enghien-Les-Bains, is there for you and offers premium comfort during your trip with the most competitive rates in the category. Whatever your need, transfer to the station, airport, tourist visit, appointment, wedding, seminar…. For your daily journeys, EV Premium Drive transports you throughout the Ile de France thanks to its premium and ecological Private Driver service. Our driver is at your service to drive you to the train station or airport with the assurance of arriving on time for your departure. votre départ. Our quality service and our premium vehicle are perfectly adapted to your business trips. We guarantee you a discreet trip in optimal comfort. Gain in flexibility with our hourly or daily service. These exceptional services will make the difference for your journeys in Île de France. Our strength is our presence in Enghien-Les-Bains, near Paris, in the Val d’ Oise. EV-Premium-Drive, your Private Driver in Enghien-Les-Bains, provides connections to major airports such as Roissy CDG, Le Bourget, the major train stations but also Beauvais-Tillié, Pontoise and the west of Paris. Our scope of intervention is wide, which allows us to answer all the requests for transportation by Private Driver. You must go to a football game at the Stade de France, whether you are with friends or a couple, our driver will transport you to Saint-Denis..
Students at the University of Cergy-Pontoise finally have an economically and ecologically interesting solution for their important journeys. Thanks to our Private Driver transport services in Enghien-Les-Bains, we offer the possibility to anyone without means of transport, living in a landlocked area or looking for premium quality transport to move easily. We also provide transport to the municipality of Bouffemont, the company’s base, from which we can drop you off to Disneyland Paris, Chantilly and many other destinations of your choice. Do you need a photographer for an important event? A wedding? An important and decisive professional meeting? Our partner, “Denis Roche Photographies”, will make professional photographs for you. You can place your trust in Denis Roche Photographies. Excellente prestation (transfert domicile-gare), véhicule très propre et chauffeur très professionnel. A recommander. J’ai passé un agréable trajet en compagnie du chauffeur et dans un véhicule vraiment top. Je les recommande chaleureusement ! Our vision of transportation is both ecological and economical. We don’t think it is necessary to pay a lot of money to travel with a Private Driver in Enghien-Les-Bains and all over the Ile de France in a high-end comfort car running on electricity. We are aware that the environment is precious and that it is time for our modes of transport to change. That’s why we specialize in Private Driver transport in order to offer an alternative to conventional and often polluting modes of transport. We managed to combine luxury and ecology with a fleet of electric cars from the famous manufacturer TESLA. We chose this manufacturer because TESLA vehicles are renowned for their reliability and unrivalled comfort. Therefore, all our vehicles are very quiet with a high level of comfort to make each trip a real moment of relaxation. Our drivers don’t just transport you from point A to point B. Our drivers are there to help you transport your luggage, inform you about the places to discover in Paris, Enghien-Les-Bains, or Ile de France, but they also know how to be discreet for your peace and quiet. Our Private Driver service is entirely designed around your comfort because it is our priority. EV Premium Drive is an innovative and modern company. 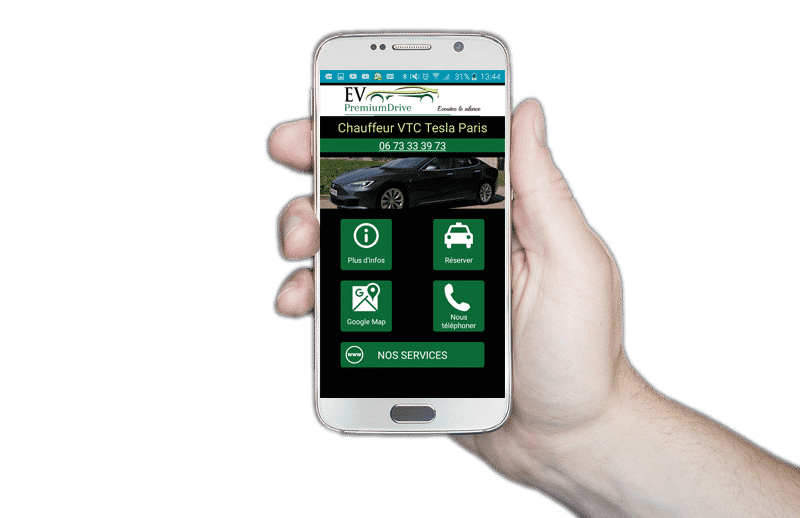 In order to offer you a quality service at the height of our Tesla vehicle, we have set up a free Android mobile application. It can be downloaded directly from the Google Play Store. You can contact us at any time and book your vehicle via our application.